The USA is a country whose flag has got a lot going on, pattern-wise. The flag has a full plate of stripes and a side-dish of stars, and a pair of hue duplets. 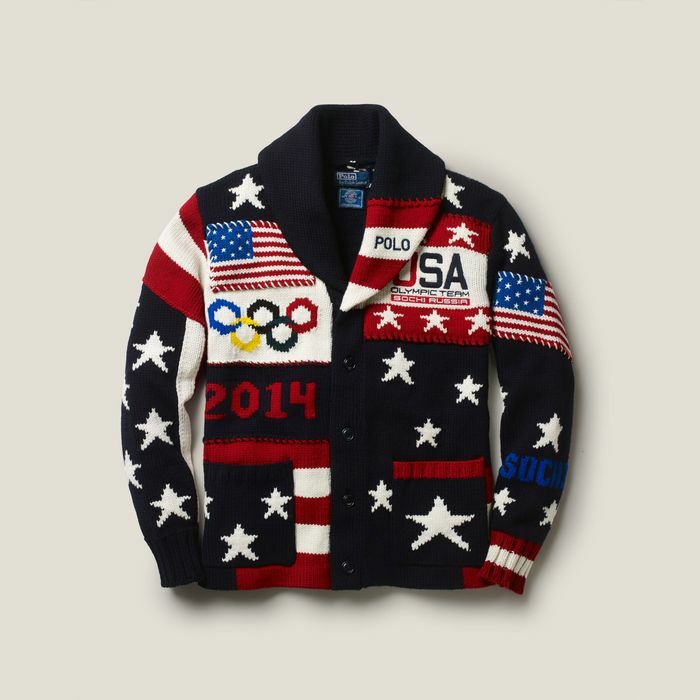 Along this theme, the Ralph Lauren uniforms for the Sochi Olympics are a pattern party, especially the knitted 2014 Sochi Olympic commemorative cardigan. It has stars — of all different sizes and sorts. It has stripes — of different widths and orientations. There are full printed flags on the right chest and down the left sleeve. It also says Sochi on the left sleeve, so in case any Olympians wander off into the next town, they can be promptly returned. The sweater has Olympic rings, of course, in their many different colors. It has solid cuffs, ribbed for a touch of texture. It has three separate U, S, and A patches. A note that reads OLYMPIC TEAM in blue and SOCHI RUSSIA in white, on red. A little note that says POLO on the left side of the shawl color. The number 2014 on the right side. A patch pocket on each hip. It’s a hullabaloo of knitwear perfect for inaugurating your first annual Olympic-themed ugly sweater party! USA Today reports that you can purchase this cardigan (of which there are only 324 available) for $595. One thing that is one thing, it is 100 percent wool.